Tucked away at the end of a quiet street, this secluded beach front property consists of only (4) four townhome residences. There is a heated swimming pool which faces out to the Gulf of Mexico capturing the warm breezes and spectacular views. Each townhome residence has approximately 2,000 sq. ft. of living space for everyone to spread out in and a private garage to safely store your vehicle and/or beach and fishing equipment. Unit # 1 3 bedrooms, 3.5 bathrooms, Sleeps 8. You will walk into the first living level where you will find an open living room/dining room/kitchen floor plan. White tile floors, rattan furnishings, with splashes of yellows, blues, and greens gives this residence a warm Florida feel. It has a newer kitchen with solid surface counter tops, light wood cabinets, tray ceiling with recess lighting, and a breakfast bar with stools. 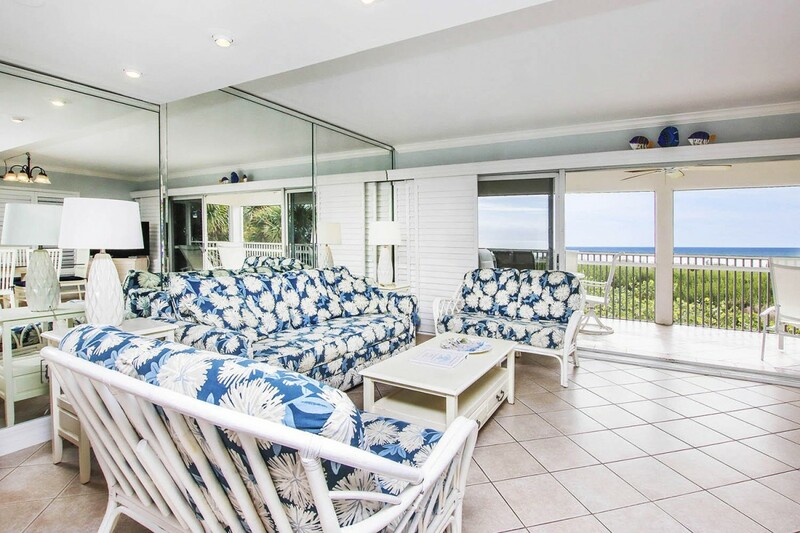 The living room features a sleeper sofa, remote TV, DVD/VCR, CD radio, and wall-to-wall sliding doors to the screened balcony which you can open to let in the wonderful Gulf breezes. There is a half bathroom also located on the main living level. Go upstairs where you will find the 3 bedrooms, and 3 full bathrooms. The first guest bedroom has two twin beds and the guest bathroom has a tub/shower combo. The 2nd guest bedroom suite has a king size bed, remote TV/VCR combo, and a private bathroom with a walk-in shower. The 3rd guest bedroom suite has a king size bed, remote TV, and a private bathroom with a tub/shower combo. Both of these suites have wall-to-wall windows providing sparkling beach views. This owner provides high speed wireless internet, beach chairs, a beach umbrella, beach towels, charcoal grill, and a hair dryer for your convenience. This is a "pet friendly" property and the owner will allow you to bring your family dog for an additional fee. SORRY, NO CATS.